The funeral took place at the cemetery on Thursday (15th April) afternoon of Pte AJ Swanborough, son of Mr Swanborough of Englands, Chippenham. Deceased who belonged to the Gloucestershire Regiment and was 21 years of age went out to France in the early days of the war and was wounded at Mons, being shot through the lungs. He was sent back to England and was for a time in a London hospital and later in the Chippenham Cottage Hospital where he died. Some comment was made on Thursday that the funeral was not recognised by the military authorities for although a short time before his death Pte Swanborough was discharged from the army as medically unfit for further service, his death was caused by the wound he received on the battlefield and he gave his life for his country. The Reverend RA Ellis, Wesleyan Minister, officiated at the funeral and Alderman Bevan and Mr F Higgins attended as representatives of the Wesleyan Sunday School in which deceased had been a scholar. The wreaths included one from the nursing staff of the Chippenham Cottage Hospital and one from neighbours at Englands. After reading the newspaper article, I visited the cemetery and found that Swanborough lay in an unmarked grave. I checked with the CWGC and they had no record of his death. So even until now, not only "was the funeral not recognised by the military authorities" but he was not recognised or commemorated by the CWGC. 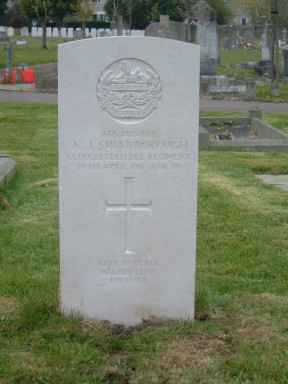 I made enquiries and obtained a copy of Swnaborough's death certificate and submitted this to the CWGC. 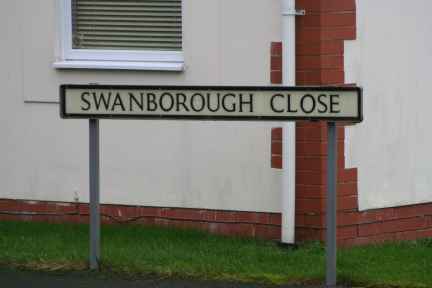 With that and the newspaper article, they agreed that Swanborough should be entitled to War Graves treatment and have placed a headstone on his grave and have recorded his name in their records. Looking at Swanborough's service papers, it seems that he was discharged from the Army on 2 April 1915 due to being medically unfit for further service. At that stage, the Army appears to have lost track of him and when he died 11 days later, they were not informed as he was now a civilian.